"..Honest and high-quality services for every vehicle!.." 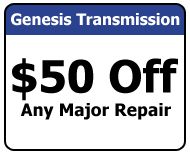 Genesis Transmission is an Transmission repair shop in Dallas, Texas, that offers honest and high-quality services for every vehicle that comes to our facility. As a family-owned-and-operated business, we understand your needs and have built our reputation on providing exceptional fleet repairs. Looking for a transmission shop near me, Our knowledgeable and friendly team looks forward to serving you soon! Genesis Transmission was established in 1998 by Rene Alvarez, a young man from the small town of Loraine, Texas. Rene grew up in a family of 18 brothers and sisters, where he learned the value of hard work from a young age. He took this work ethic to Dallas and began working in the transmission industry, where he excelled greatly. He managed many large transmission shops before deciding to open his own facility. Rene started his business in a one-bay shop, then moved to a 5-bay facility before reaching his final location—an 8-bay shop capable of serving large fleet accounts. The facility is now owned and operated by Rene and his son, Lee. Request an estimate on your Transmission repair by contacting us today at (214) 275-6645.